Kaitlyn Shannon graduated from McGill this spring with a BA in International Development Studies and Political Science. In April, she was named one of the winners of the 2012 EU-Canada Young Journalist Award, an annual competition designed to recognize outstanding journalistic potential among Canadian students. 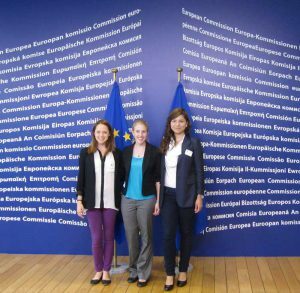 She and her fellow winners participated in a weeklong study tour of various EU institutions and the Canadian Mission to the EU in Brussels, Belgium. 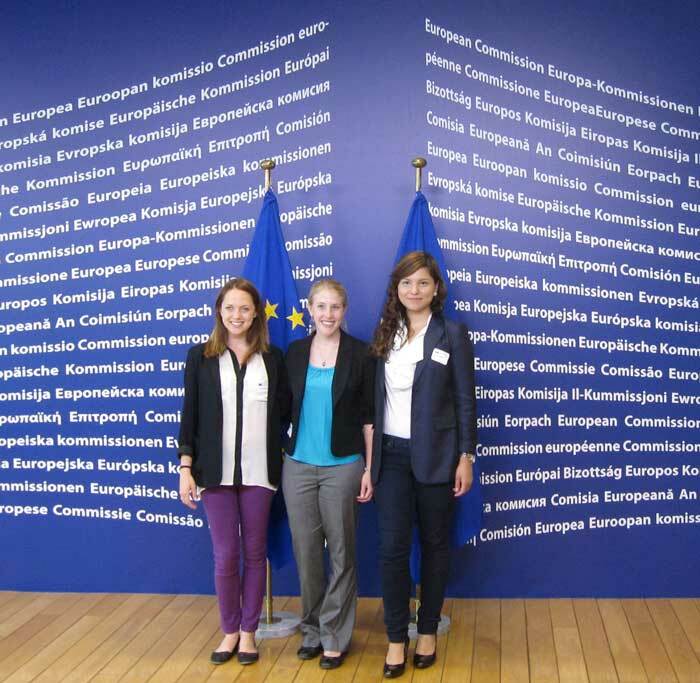 Read on to learn about Kaitlyn's adventures in Brussels. Kaitlyn Shannon (centre) with her fellow 2012 EU-Canada Young Journalist Award winners Emily Dickinson (left) and Patricia Vasquez Lopez (right) at the press briefing room at the EU Commission . Camera crews jostled for positions in front of the stage as the EU Commission’s president, José Manuel Barroso, prepared to make his entrance. The packed room fell silent as he slowly made his way over to the podium. A few rows back, I sat surrounded by reporters from around the world, and flicked through the channels on my headphones, listening to a live translation of the press briefing in all 23 EU official languages. Attending Barroso’s press conference was just one of the many highlights of my trip to Brussels in May. As one of the recipients of this year’s EU-Canada Young Journalist Award, I had the opportunity to take part in a week-long study tour of the EU institutions, delving headfirst into the complex structures and relationships of these influential organizations. Organized by the College of Europe and sponsored by the Delegation of the EU to Canada, my trip spanned five jam-packed days. After receiving a series of lectures about the history of the EU, our days were filled with multiple trips to each of the EU institutions, where we met with both politicians and press, getting a feel for their day-to-day routines working in Europe’s capital. To pick a highlight of the trip would be impossible, so perhaps I’ll recount a few. Established in 2009 by the Lisbon Treaty, the European External Action Service is the newest of the EU institutions. In fact, it is so new that the building itself is still under construction. Guiding us through the unfinished entrance of the building, our host joked that every morning she arrived at work wondering what new furniture might have been added during the night. For me, the construction of the building was a perfect reflection of the dynamic nature of the EU. This international organization is constantly growing and changing. In 1951, six European nations joined together to form the European Coal and Steel Community and today that community has evolved into an economic and political union of twenty-seven diverse countries; and it still continues to grow. After Barroso’s press conference, I walked across town with the two other award recipients. We passed in front of the EU Parliament, where a number of politicians were playing soccer on a makeshift field to promote the upcoming Euro Cup. After watching the game for a while, we continued on and soon reached our destination: the crisp, clean Thomson Reuters newsroom. The modern interior décor seemed incongruous with the art-nouveau architecture of the building’s outside façade, but there was nothing else discordant about the systematic bustle of activity inside the newsroom. We met with the editor-in-chief, who proudly showed us a minute-by-minute graph of the value of the euro: and at the very moment when Reuters had broadcasted Barroso’s announcement over its newswires, the euro’s value shot up by half a cent! One evening, after a long day of running back and forth across Brussels, we had a dinner meeting. We sat on the patio of a typical Belgian pub as the setting sun cast a warm yellow glow on the beautiful old buildings surrounding us. Over a local beer and Belgian fries, we spoke with Philippe Perchoc, an assistant professor of political science at the prestigious College of Europe in Bruges. As a political scientist myself, I found the conversation that flowed to be captivating. We discussed everything from the history of the EU institutions, to the voting patterns of EU citizens, to the foreign policies of the Baltic states (Philippe’s area of expertise). The dialogue advanced well into the night, and it was with great reluctance that we eventually succumbed to the chilly evening air and parted ways. A topic that constantly emerged in our discussions was the Comprehensive Economic and Trade Agreement, which is currently under negotiation between Canada and the EU. We were exposed to a diversity of opinions and viewpoints regarding this agreement, from the DG Trade at the European Commission to the European External Action Service, and from a Member of the European Parliament to Canada’s own diplomatic mission to the EU. Listening to so many different voices comment on this one subject illustrated the range of perspectives that exist even within the EU itself. For me, one of the most interesting institutions we visited on the trip was the European Economic and Social Committee (EESC). This is an often-overlooked institution that I had learned very little about during my studies both at McGill and in France. Although it doesn’t receive the same attention as the more powerful institutions that dominate the media, the EESC plays an important role in the functioning of the EU. It is the only EU institution run entirely by civil servants, who represent the interests of trade unions, employers, and civil society. Though technically the EESC holds no binding power over the other institutions, the Commission (the body which drafts legislation) must consult the EESC when creating any new directives. And in fact, 4/5 times, the Commission acts on the advice of the EESC. On a side note, the EESC is also the only EU building to be installing bee hives on its roof! The trip to Brussels surpassed even my greatest expectations. We were able to meet dozens of people from diverse fields and backgrounds, and the opportunity to sit with them around a table and have a genuine conversation was truly invaluable. The knowledge I gained about the EU was intricate and nuanced, and could not have been paralleled in a classroom. I am so grateful to have had this life-changing opportunity. Though my trip has come to an end, I hope that in the long run it will be just the beginning of my interactions and involvement with the European Union. Kaitlyn Shannon graduated from McGill this spring with a BA in International Development Studies and Political Science. In April, she was named one of the winners of the 2012 EU-Canada Young Journalist Award, an annual competition designed to recognize outstanding journalistic potential among Canadian students. Read more about Kaitlyn and the Award here.